The "naughty chair" and I were not strangers at nursery. I was not a tiny delinquent, but my occasional vices of biting and spitting necessitated intervention. Soon enough, I would leave my lawless ways behind me but, for a while, it seems I was That Kid. I clearly had stuff to get out of my system*. I don't remember enough to offer any insight into the motives behind my behaviour. Possibly my hearing was poor, so I was struggling to hear and communicate my frustrations. More likely, it was just a phase. It surprises me how much I can remember from nursery. I remember dashing into the loos and weeing as fast as I could in the doorless cubicles. I remember the iron tang of blood in my mouth and how my cranium and jaw throbbed when I fell off the monkey bars, smashing my chin on the asphalt below. I remember milk break in the summer (before Thatcher snatched it), sitting outside on grassy hillocks clutching diminutive glass bottles of warm milk. I remember the particular satisfaction of piercing the silver foil top with a sharp, slim blue straw. One stint on the naughty chair remains very clear in my mind. I don't remember what infraction had me banished there, but I was seething with indignation at the punishment and determined not to feel ashamed. It occurred to me that the chair elevated me above the others, not unlike a throne. At this, I suspect my chin went up a notch and my face assumed a look of haughty disdain for my subjects. My imagination had kicked in and all hope of me learning any type of lesson regarding behaviour and consequences went out the window. On nursery days, I was ferried to and from home in a sky blue mini-bus. I have a flashbulb memory of sitting on the bus with my letter book in my hands. I can vividly recall the precise blue, the warm, matt surface, the shape of it. I spent a lot of time looking at this small blue exercise book while in transit. Each page displayed a letter in dotted print for us to trace, a relevant picture to colour and some lines to practice writing the letter. It was here that I started to learn to read. I picked up the letters and their sounds quickly and I left nursery well on my way to reading in earnest. This picked up apace at infant school where I read my way through their entire library of books, well before the end of my last year and was assigned my own reading "group" of one. There were only 30 of us at infant school, spread between two classes. It seems this was not sustainable and, after a happy year or so, we were split roughly in half and despatched to the two local middle schools, which became "first and middle schools". Not long after the move, Mum had to go in and "have words" because I was being sent home with "Peter and Jane" books, while my bedside table was piled with the best part of Enid Blyton's oeuvre. I hammered "The Faraway Tree", reading it over and over again. It is hands down Oscar's favourite, too. Of course, reading it now, I despair at the 50s cultural values, bland prose and repetitive tropes (someone gets caught in Dame Washalot's laundry water / looks in on the Angry Pixie with predictable results / eats a Toffee Shock and got a surprise), but the magical lands at the top of the tree utterly caught my imagination. They cropped up in my dreams, my writing and my pretend play. Like Oscar, I was less enamoured with the lands populated by tricksy characters or where the children faced peril. It was escapism and fantasy I was after, so it was the 'treat' lands I loved - the Land of Birthdays, the Land of Take-What-You-Want and their ilk. I adored Blyton's boarding school stories, too and I absolutely went to boarding school for my sixth form years as a direct result. Inexplicably, I did not have one midnight feast or play a single game of lacrosse. I did however get 'gated' and sneak to the pub. Would Darrell Rivers have approved? Sadly her scant characterisation offers no clues either way. In middle childhood, there was an almost compulsive aspect to my reading. It occasionally got in the way of things, irritated those around me, caused me physical harm (cf. the lamp post incident). Even my weekly childhood library visits did not satiate me. Nevertheless, as I swung through the unfriendly security barrier and made a beeline for the children's section, I was in my happy place. I scanned the rows of books, often particularly on the look out for stories about witches or their familiars. Happily, this was a rich seam of children's literature in the 1980s and I discovered dozens of wonderful witchy books. What was their special appeal? Women with power? Women as "other"? Probably not. I think I enjoyed the simple possibility of magic and the dilemmas it invoked. I immersed myself in these stories. A small unspoken part of me wondered whether, if I applied myself, I might be a witch some day. It seemed possible. A secret magical lineage would explain a lot about me. I would role play witches. Not green-faced, cackling villainesses, but career witches, diligently applying themselves to potion-craft or spell-making. One night I dreamed that a witch knocked on the window of my first floor bedroom window, waking me from sleep. She invited me to fly with her and I spent hours soaring and swooping in the night sky over my home town. I wanted to share the experience with Mum and persuaded the witch to return home to collect her. The following morning, I wasn't wholly convinced by her assertion that it must have been a dream, when I made some comments about our nighttime adventure. Looking back, despite my fierce imagination, this episode provides little clues to my pragmatism. The witch had a cat familiar, but it remained in a wicker hamper, securely belted to the rear of the broomstick. I clearly doubted the physical probability of a small cat hanging on to the vehicle as it swooped and tossed in the sky, and resolved this problem in my oneiric state. The library bestowed upon me countless great books - "Tom's Midnight Garden", "Stig of the Dump", anything by Joan Aiken or Roald Dahl, "Charlotte's Web", "Little Women". Towards the end of my period as a heavy user of the library, I embarked on the final vestiges of the children's section - the Young Adult shelves. I had been eyeing these books for some time before I realised there was nothing stopping me from reading them. Seemingly without exception, they all had marvellously intriguing titles like "After the First Death", "Children of the Dust", "Catch You on the Flip Side" or "Slambash Wangs of a Compo Gormer". The characters in these books led me through new human dilemmas and moral grey areas. I discovered post-apocalyptic dystopias and stories without a happy ending. When I had exhausted my "to read" pile and a library visit was days away, I dipped into my mum's books and read things like Irving's "Cider House Rules" and discovered adult life was just as complicated as I had begun to suspect.. I also remember picking up "Jonathan Livingstone Seagull" by Richard Bach, a bizarrely ubiquitous guide to the power of positive thinking from the 70s. Right now, it would be my book nemesis: self-helpy, religiously-themed. Not my thing at all. The message was delivered through an allegorical tale of a seagull whose passion for flight set him at odds with his community. It is neither well conceived or written and really has nothing to recommend it, but it was the book that introduced me to sub-text and allegory and metaphor (so thinly veiled was the Judeo-Christian lesson, that even a child could see through it), so it served a purpose. In my early teens, I plucked "Love in the Time of Cholera" from my Mum's shelves and lost myself in Marquez' hot, visceral depiction of love - failing, in my adolescence, to see the anti-love story. I was hypnotised by the perfection of Marquez' opening sentence "It was inevitable: the scent of bitter almonds always reminded him of the fate of unrequited love" and would sometimes open the book simply to marvel at those 17 words**. I wrote the book up in my reading journal for English class. My teacher summoned me to her desk to kindly suggest I stick to including books I had actually read. She rather took back her accusation after I spent the next fifteen minutes enthusiastically espousing the merits of the book, a verbal onslaught no doubt accompanied by wild gesticulation. At 'A' level, people seemed bewildered that I had taken English Literature - not least my English teacher, although he was more confused that I decided to pair his subject with Biology and Chemistry (most other adults considered English as the interloper). He was a gifted teacher, immensely passionate and knowledgeable about his subject. It oozed from him. No, not "oozed"...it radiated out. He unleashed it. He clearly relished being gatekeeper to all these marvellous texts and took the responsibility seriously. It was important to him that we understand and connected with these works. He was, by turns, relaxed to the point of somnolence or dramatic and mercurial. Books were swept off shelves. He would storm out. He would cry at prep left undone. Whether he was acting (another of his strengths) or experiencing mental strife, I can't say, but he certainly had our attention. We would enter the classroom trepidatiously, wondering who we were going to meet. He would sometimes talk for entire lessons, barely seeking a contribution from us, ranging over a topic, tangenting wildly. Sometimes he would be almost silent and we would talk, wondering if our words had any value. We learned, though. Through Pinter, John Clare, the Metaphysical Poets, we learned to take books and shake them until the ideas, rhythms and aesthetics fell out of them. I often had my English teacher in mind when I read Donna Tartt's "The Secret History" of which I am an unashamed fan. It features the arrival of Richard Papen, a rather bland transport from California, into an exclusive coterie of bright young Classics students, curated by their enigmatic teacher, Julian Morrow. The story works backwards from an accidental murder during an ill-conceived bacchanal. Some people love to hate on this book. It's one of those novels that people arrive at with high expectations, knowing that the book trails legions of cultishly devoted fans in its wake. I read the book when I was about 15 or 16, which is the perfect time to appreciate its brooding atmosphere, tainted with menace. It is a stylish read, with a superb cast of despicable, unlikeable characters and a tightly written murder mystery at its centre. I will happily concede that the book may be unsubstantial and lacking in heart, but it is voluptuous and compelling. Tartt's characters sprang to life in my head, fully-formed and I urgently needed everyone to read the book so I could talk about it with them. 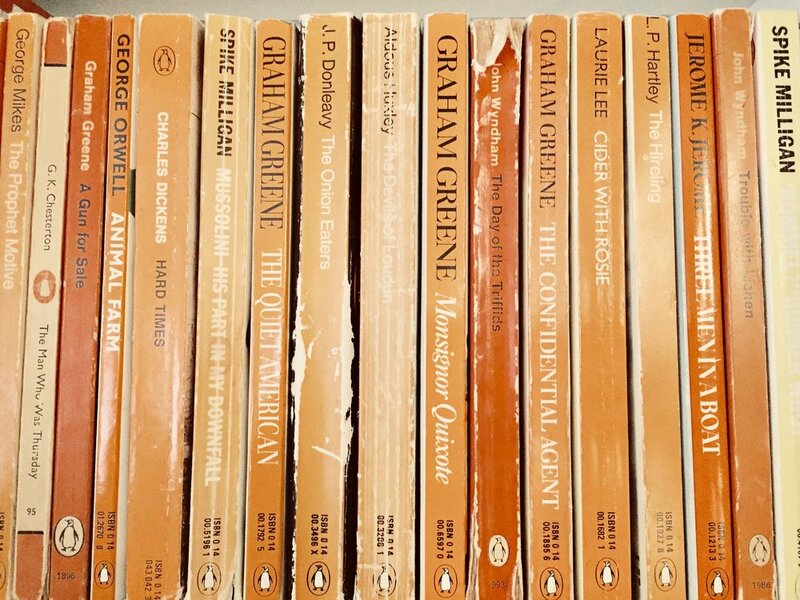 I rescued dog-eared copies from charity shops as if they were lost puppies and re-homed them on my shelves. If someone confessed that they hadn't read it, I would thrust one of my copies at them. The book is crying out to be made into a movie but despite the rights having been picked up a couple of times, it has never happened. I am strangely happy that the rights have reverted to Tartt and that she is hanging on to them. The chances of the movie being cast to my satisfaction seem slim, so this saves me some angst. 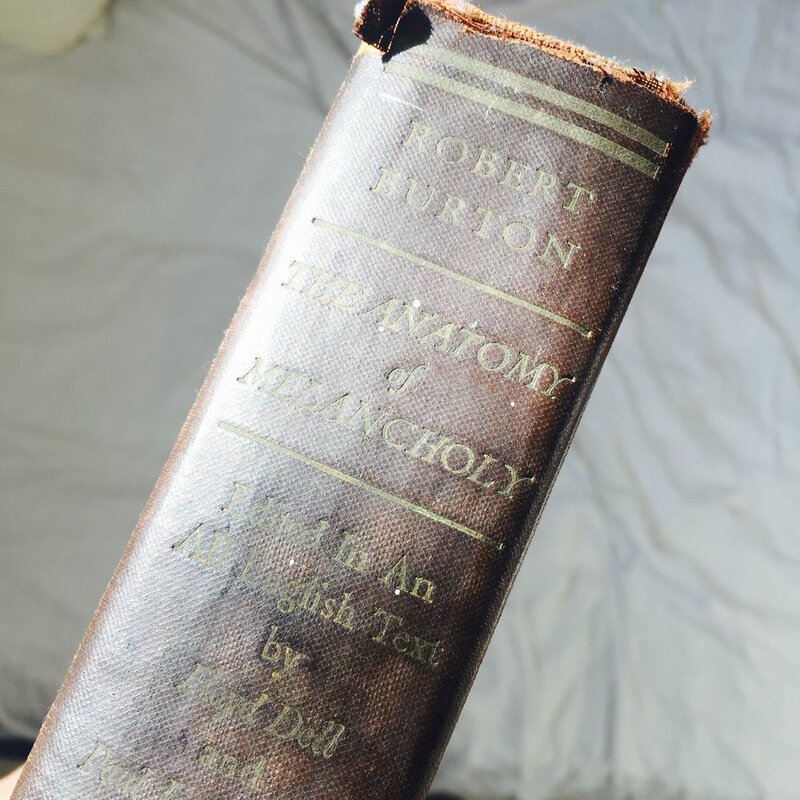 Just recently, Philip Pullman's latest revisitation to Lyra's universe, "The Book of Dust" has been released and in his promotional rounds, Pullman mentioned one of his favourite books "The Anatomy of Melancholy". I was overjoyed to see the title of this book in print, even more so in the context of an author whose work I have so enjoyed. I discovered a copy of this book in my late teens or early twenties. The curious title piqued my interest as I browsed in as a second hand book shop. I was not in the habit of picking up dark, dusty books and so I left it on the shelf, but I found myself circling back. I opened it and read a few pages and was amused to discover that the title was not a metaphor - the book was, indeed, a quite detailed examination of the state of melancholy. I bought it. I read it from cover to cover, excepting the large tracts of Latin. I have dipped in and out of it many times since. Pullman himself describes with far more eloquence than I could ever muster why this book is such an utter pleasure. It is the book that taught me to be a free and unfettered reader. Except for chick lit. My reading habits changed dramatically after having children. The Kindle app on my phone became my window to the written word. I adore books as objects, but when the boys were tiny, my prime reading hour was 3am. In the dark, it was not possible to hold open a book while simultaneously attending to the surprising complexities of feeding a baby. A light to see the pages may have roused them from half-sleep. Reading on the phone was practical. As a new mum, I was dangerously under-slept and shedding brain cells like bad cards, so the types of books I read changed, too. Pre-children, I mainly read contemporary fiction. Wonderful novels, that played with form, scrutinised human existence and luxuriated in language. My new reading conditions demanded something different. Books I could pick up and put down easily. Stories which could engage and divert my weary brain, without challenging it too much. I discovered the urban fantasy genre and cracked through the Ben Aaronovitch's "Rivers of London" series, Neil Gaiman's "Neverwhere", "Un Lun Dun" by China Miéville. These books delved below the surface of my city, imposing magical worlds just beneath the skin of London. They added to the otherworldly, dreamy feeling I felt as I endlessly pushed a buggy around my neighbourhood, slightly high on lack of sleep. We currently have no room to hang pictures in our house because our walls are lined with bookshelves. The books are an archive, insulating our home. There is little current reading material on it. I estimate more that 90% of our book purchases are now digital. Ben still reads like the clappers but, since the boys have started sleeping through the night, I am reading a lot less. My day is a hodge-podge of moments, without the long stretches I need to get stuck into a book. And I do not know this "evening" of which people speak! I miss my quiet and constant papery friends. When we get our evenings back, I will resume my foremost pleasure immediately. "The past is a foreign country: they do things differently there." -- L.P. Hartley's "The Go-Between"
"Marley was dead: to begin with." -- Charles Dicken's "A Christmas Carol"
Want to read more? A monstrous family favourite.